Canned Food During Pregnancy - Is it Safe? Q: Is it safe to eat canned food during pregnancy? A: Cans or metal lids on glass jars can rust. When rust is deep enough, tiny holes open in the can or lid that may let spoilage agents in. Shipping accidents that dent or crush cans cause problems. There are limits to how long food quality can be preserved. Why? Several factors limit the shelf-life of canned foods. Can corrosion: Food reacts chemically with the metal container, especially high-acid food like canned tomatoes and fruit juices. Over several years, this causes taste and texture changes. It eventually lowers the nutritional value of the food. Temperatures over 100 degrees Fahrenheit are harmful to canned foods: The risk of spoilage jumps sharply as storage temperatures rise. 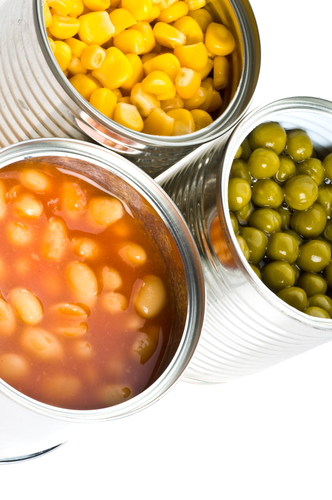 At prolonged storage temperatures above 75 degrees, nutrient loss in canned foods increases. Light can cause color changes and nutrient losses in foods canned in glass jars. Never use foods from containers with these spoilage warning signs: loose or bulging lids on jars; bulging, leaking or badly dented cans (especially along the top, side and bottom seams), or foods with a foul odor. Store in a cool, clean, dry place where temperatures are below 85 degrees (between 50-70 degrees is good) but not freezing temperatures. Rotate foods so the oldest is used first. Try not to keep canned foods more than one year. Use canned meats and seafood within 12 months. Use low-acid canned foods within 8-12 months. Use high-acid foods within 12 to 18 months. Foods stored longer will be safe to eat if the cans show no signs of spoilage or damage but may deteriorate in color, flavor and nutritive value.